A wonderful Bangkok cabinet designed by Yngve Ekström for Westbergs Mobler, Sweden, 1950s. Solid beech legs with teak doors and sides. Inside there are three drawers and adjustable shelves. Very good vintage condition with key present. A rare Yngve Ekström cabinet model 'Krus' in teak with key included. Produced by Westbergs Möbler in Sweden in the 1950s or 1960s. Ships worldwide. Pendel/Reflex wall candleholders. Pierre Forssell, Skultuna. Sweden, 1950s. 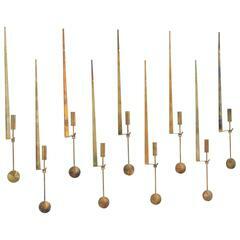 Good original vintage condition, patinated brass. 2 W x 3.25 D x 19 H inches. Stamped with makers mark. 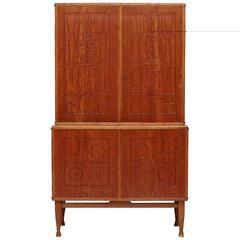 Striking “Bangkok” cabinet by Yngve Ekström, made from teak with a graphic, embossed pattern on the door fronts. Details made in beech create a subtle contrast. Rare cabinet model Krus designed by Yngve Ekström. Produced by Westbergs Möbler in Sweden. 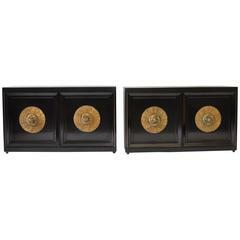 Pair of 1950s decorative cabinets. Refinished in a rich dark walnut (almost black). Gold painted resin handles. Recessed casters.